Hey, everyone! Our Twitter just hit a milestone of 3,000 followers, so to celebrate, we’re holding a contest and a giveaway! For our contest, all you need to do is take these bases of Tara’s t-shirt and draw in the most Tara-tastic design you can think of on it! Make sure you’re following us on Twitter, then tweet it at us with the catchy alliterative hashtag #TaranormalTeeOff. Like, retweet, and otherwise share those posts like something that gets spread around a lot, and we’ll pick our favorite from the lot. The winner will receive an official Heart of the Woods flyer illustrated signed by Rosuuri, HotW’s character & CG artist, as well as one of two HotW keychains of their choice! Not only do you get this cool free stuff, but your t-shirt design will be featured in-game in the release of Heart of the Woods! You’ll get a free copy of the game once it releases, too, so you can see the design in all its glory! What’s it gonna be? Something… beautiful? Creative? Stupid? A mix of all three? Whatever it is, make it good! And, most importantly… have fun with it! For the giveaway, simply follow our Twitter and retweet our giveaway tweet! 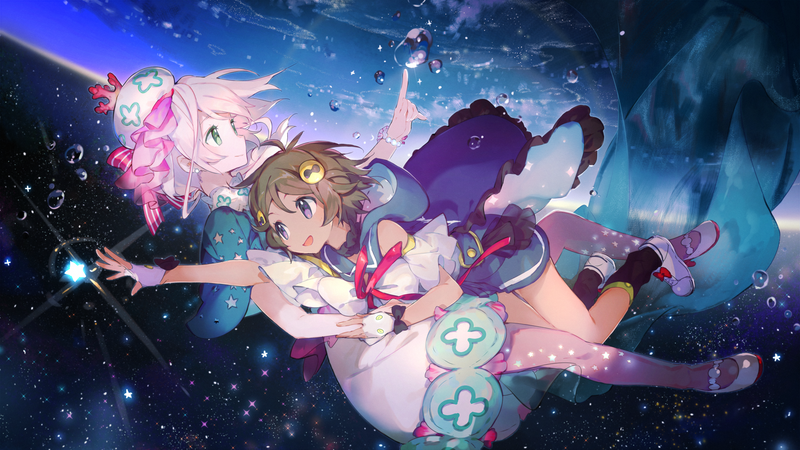 Two winners will be selected at random – one winner will receive both HoTW keychains, and one other winner will receive a set of 4 acrylic stands for The Waters Above! 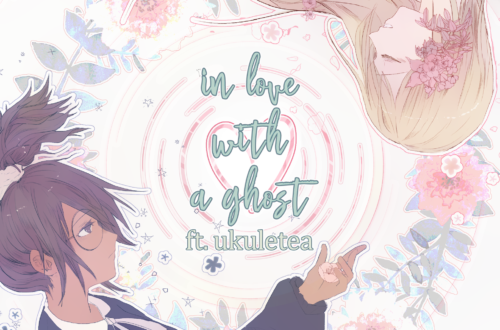 Both the contest and the giveaway will end on September 1st, 2018, at midnight (or 7:00 AM GMT), so… don’t hesitate to get started! We look forward to seeing what you create. And, again, thank you all for the support! As a personal anecdote as Studio Élan’s new PR manager… I’m extremely grateful for all the love and support everyone has shown us on social media in the last week! I think I speak for all of us when I say that we’re more than happy to be able to bring these fantastic love stories to those it would resonate with the most. Please, keep on showing us your love and support! Love is what we’re all about, after all. …As with every giveaway, there’s going to be fine print. For those entering the t-shirt contest, make sure that you are able to provide it to us as a PNG file at the exact same resolution (364px by 793px) within the given boundaries. Try to keep the transparency intact, too! We may have to make some edits to the image if necessary to keep it within the game’s art style, but we won’t be making any changes to the shirt’s design itself. For both the contest and the giveaway, please note that you’ll need to be willing to give us your address in DMs. Also, we won’t be able to ship outside the contiguous United States. 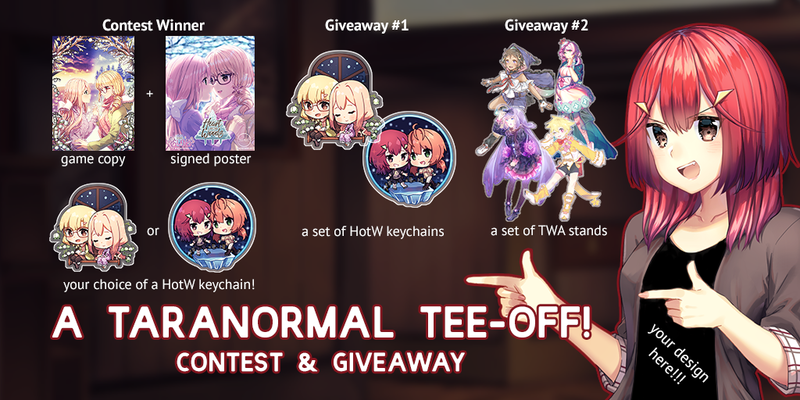 If you’re from elsewhere, you will still be able to enter and win the contest and have your t-shirt design be included in Heart of the Woods, along with the free digital copy, but you won’t be able to get the free stuff, unfortunately. You won’t be able to enter nor win the giveaway, either… but the support you can give by spreading the word is still appreciated! Also… no purch nec. This isn’t a tweet, so I don’t have to actually shorten it from “no purchase necessary”, but I just really wanted to say “no purch nec”.